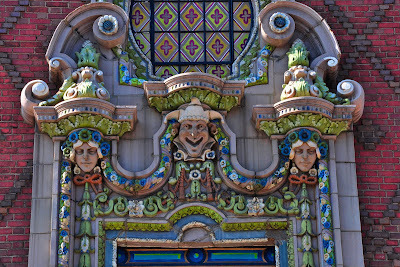 A colorful part of the Aragon Ballroom in the Uptown neighborhood. According to the Aragon's website, it was built in 1926 at a cost of $2 million dollars (admission was 90 cents). It is named after a Spanish providence and designed to look like a Spanish palace courtyard. Through the 50s, it was a dance hall. In the late 50s, an explosion next door did a lot of damage (broken chandeliers, flying bar stools). It had to close for repairs and by the time it re-opened, the dance hall phase had passed. It next became a skating rink, then a boxing/wrestling sports arena, then a "mod-type discotheque", more rehab and refurbishing work, back to a ballroom dancing hall, then a "monster rock" marathon concert venue, yet another try at big bands and ballroom dancing, even more rehab and restoration, and back to rock concerts. Yes, a colorful history to go with the colorful venue. There really is some nice detail there! I like the colors too. I love the detail on the building! and all the history surrounding Uptown is indeed fascinating, isn't it?